This finely handcrafted hardwood clock is made from Certified Sustainable Appalachian wild cherry and walnut woods, completed with silky smooth oil finish. We laser etch under the clock face for a very beautiful personalized gift for a wedding, house warming, graduation, anniversary or other gift giving occasion. Enjoy telling time with this simple clock made from beautiful cherry wood and American made Quartz movements. We can personalize it to create a life long treasure. 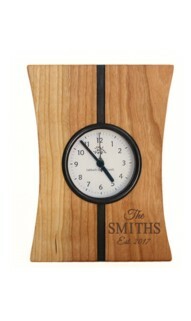 This clocks makes the perefct graduation, house warming or corporate gift. 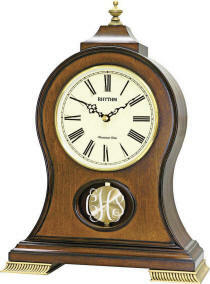 Enjoy telling time with this simple clock made from beautiful cherry wood and American made Quartz movements. We can personalize it to create a life long treasure. Clock measures 8 in.x 6 in. x 2in. A mini grandfather, the Hamilton's unique flare gives this model a special personality with the look of a grand father clock. 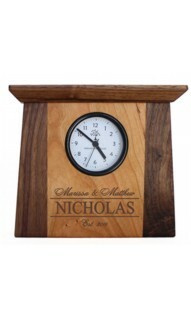 We laser engrave the open area at the base of the clock with lettering of your choice. The clock is 19 1/2 in. high, 4 in. deep, and 6 1/2 in. wide at the base. The Hamilton clock features quarterly Westminster chime & striking, hourly Westminster chime & striking, 16 classical melodies and 3 Christmas melolides. Limited one-year warranty. The Sonata's clock has a lovely and unique personality from the shape, all the way to its detailed base. The WSM Sonata displays a simple Roman numeral dial. It comes with a special WSM movement that allows you to play an hourly Westminster chime, a quarterly Ave Maria chime, or a Bim Bam chime. It also has an automatic night shut off feature. Clock is battery quartz operated. A beautiful mantel clock that we artfully engrave in the lower glass area. The pendulum will be visible behind the inscription. The clock dial has roman style numbers and a gold colored bezel. We laser engrave on the glass to create a beautiful and personal gift. 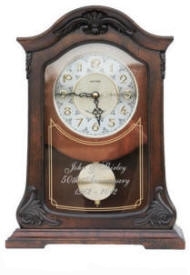 This clock would be a wonderful 50th anniversary gift, or a wedding gift for a special couple. A variety of musical melodies are available, as well as Westminster chime (Big Ben), and Christmas melodies. A beautiful personalized quartz mantel clock. Limited warranty. Battery operated. 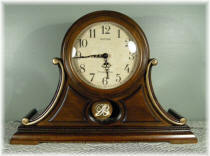 A stunning mantel clock with Westminster chimes, classical melodies, Christmas melodies, or no sound. There is also a night shut off mode. 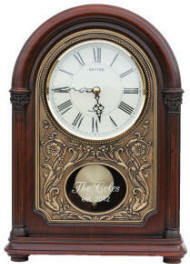 This beautiful Nice clock has a quartz movement; battery operated, and a pendulum that can be seen through the glass. We will personalize on the glass at the bottom of the clock with an etching and engraving process to produce a beautiful personalized clock that will be a cherished gift. Choose from 16 melodies of classical music with 4 x 4 Westminster (Big Ben) chimes. Includes three Christmas melodies, Silent Night, Joy to the World and We Wish You a Merry Christmas. 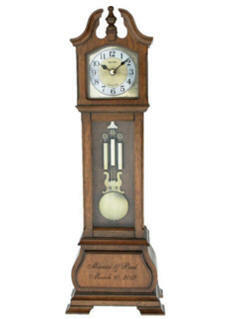 This quartz, battery operated, pendulum clock, captures the essence of Italian clock design today. 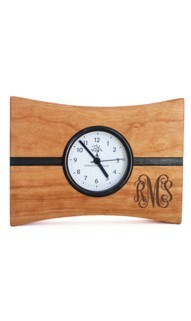 The beautiful wooden mantle clock that will truly be appreciated when it is personalized for the recipient. We will laser etch glass coverying the pendulum with their last name, initials, or a monogram.